Wind Power - Without Limits! - Wind Power Cube, Inc. Multiple modules are used in any formation to quietly produce energy. Many smaller turbines micro-generating power increases uptime and reliability. Can be used to retrofit on exisiting wind farm structures. 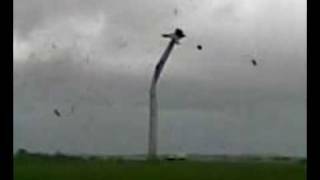 A Wind Turbine with no center axle! 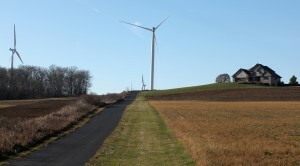 Our wind turbine is supported around the outer rim, eliminating the need for an axle or hub. The modular design surrounds the turbines moving parts and provides an install anywhere package. Square modules are easy to install and safe to operate. A practical way to produce wind energy on virtually any building or structure. Reliable operation in fierce storms provides continuous emergency power for critical operations. Modules frames easily attach to existing cell & radio towers. Self contained blade tips increase safety and reduce strike risk. Wind Power - Without Limits! Wind Power Cube, Inc. is a green energy manufacturer of a U.S. & Internationally patented, first of its kind, wind turbine. The innovative shape and axle-less design safely generates energy in all wind conditions. The Wind Power Cube is a modular wind turbine, self contained in a square frame. The rotating turbine is suspended around the circumference and rotates freely without any center axle or hub support. Power is generated around the circumference, leaving the center open with no obstructions. Blades of the turbine are designed to accept wind from either the front or the back. Traditional turbines are only supported at the hub/axle. This creates enormous stress, leading to fatigue and failure over time and under extreme wind conditions. To compensate, existing turbines slow or brake, reducing power output just when the wind blows the strongest. The circumferential support allows the turbine to continue spinning and generating energy. Our innovative design, with the blades enclosed in a frame, allows safe and flexible mounting anywhere; on top of commercial buildings, on cell towers, on ocean vessels or on top of residential roofs. The shape is also perfect for building a matrix of micro-generation units in a wind farm environment. The Wind Power Cube solves several other wind turbine problems too. Millions of birds, some endangered, are killed annually by traditional turbines. Our module presents a profile that can be seen by birds, reducing or preventing most bird strikes. And, with no exposed blade tip, our modules are quieter and safer to install and maintain. Bringing clean power to the world is Wind Power Cube's part to a greener world. Wind power is one of many steps to making our world a beautiful place forever. If you have any questions, comments, or interest in purchasing a wind power cube, please contact us using the form to the right.